Posted on May 25, 2015 at 6:06 am. Squatting is one of the most beneficial exercises you can perform. There are various types of squats but the benefits remain the same. If you are not squatting in you’re doing something wrong. When was the last time you squat? Chances are if you train at AMP you have squat quite recently. Why? Your trainers understand the importance and benefits you will gain from this exercise. A common misconception is that squats are a leg exercise only. While you legs are needed, so is your entire body. Other than your quad and glutes, a good squat also requires your hamstrings, adductors, erectors, abs, obliques, traps and other tertiary muscles. The more muscle worked through an exercise the more calories burned and the squat most definitely engages a lot of muscle groups. Depending on your goals and abilities there are various forms of squats that can be used. Goblet Squats, Front Squats, Back Squats, Hack Squats, Olympic Squats, Overhead Squats and the list goes on and on. 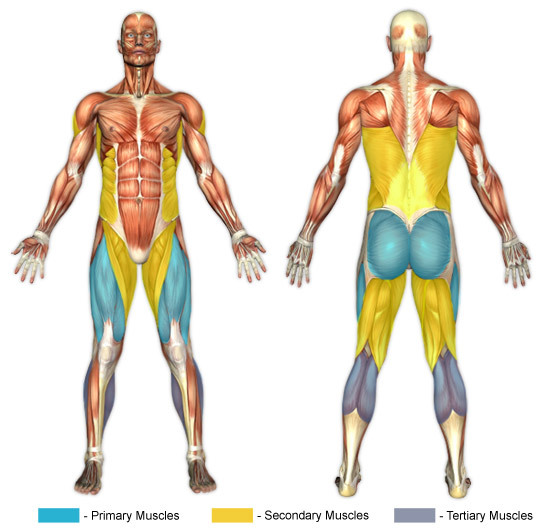 All of these, when done properly, will require all the muscles listed above and even more so depending on the movement. There are also programming variations to increase your gains as well. The squat is one of the most versatile and necessary exercises. Another fallacy associated with squats is that they are bad for your knees. 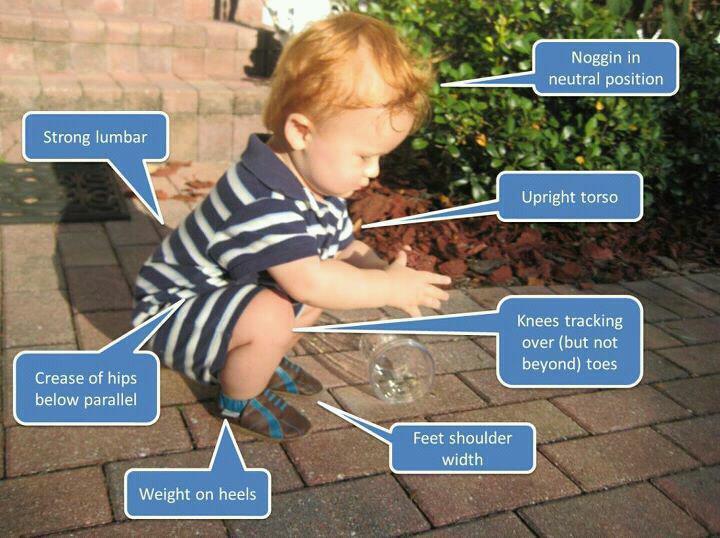 Have you ever seen a child squat? They look so comfortable, so natural at the bottom of the squat. I’ve even witnessed children playing with toys while sitting in a squat. Now, Have you ever seen a child with “bad knees”? unless there is something inherently wrong, no. Squatting is not bad for your knees, squatting bad is bad for your knees. So next time your program calls for squats, Get excited, get tight, get low and get some gainz! Posted on May 18, 2015 at 6:19 am. Well the weather is getting nice out, which means barbecues, beach trips, picnics, parties and unfortunately poor choices in diet. This time of year is when we hear and overwhelming amount of “I’m trying to eat healthy, but… I have a BBQ or Party every weekend”. Next week we will go into how to become proactive about your food choices and guarantee your success to stay on track. However, today we are going to examine one reason why you feel so slow and tired the Monday after your summer weekends. Alcohol. There is one disclaimer that all companies who sell any type of alcohol place on their ads and products: “Consume in moderation”. The reasons for this are all listed above. Synonyms for moderation include self-restraint, self-control, self- discipline. So are you showing these when it comes to consume alcohol? If not you are sure to experience these effects. Not only will you deal with all the issues mentioned above, but you will also notice a decrease you performance in the gym. You will suffer from weight gain, alcohol is full of calories that will not benefit you toward reaching your goals. so next time you go to pick up a glass, stop and think. How will this benefit me? Have I already had enough? What is more important to me, my goals or this drink? Posted on May 11, 2015 at 7:07 am. No doubt, at one time during your training or after a bootcamp, you have seen people doing recovery work. I asked 5 people what they do for recovery after a workout. 4 of them said “stretch”. When asked why they stretch, they could not explain why they were stretching, while one said, “it feels good”. We have previously discussed stretching but today we are going to look at a great recovery aid, SMR and why is should be used instead of stretching. SMR stands for Self Myofascial Release. Last year AMP hosted a recovery class, teaching our clients how to recover after their workouts. So it may be common to see clients leaning against the walls or floors with various balls in sore spots, or perhaps foam rolling. These are both forms of Self Massage Release. SMR can address tight areas, areas of pain, or just general soreness. The intent is to break up adhesions and release any restrictions you may have in your muscles & fascia. You can perform these techniques before your warm-up or even after your workout. A note of caution: if you feel numbness or throbbing at the site in which you are working, discontinue and find a new place to work. One thing I am very proud to say is the fact that you see very little stretching performed as recovery. While people enjoy stretching, they do not understand what it is actually doing to your muscles. It may feel good, and unfortunately it caught on as a standard for recovery years ago without further examination as to whether or not stretching is good for you in particular. If you have normal range of motion in a joint or muscle, please don’t stretch. Excess stretching can cause tension around your joints to become lax and thus cause instability and later injury. If you wonder whether or not you should stretch feel free to ask your trainer for some help. Stretching can be beneficial, however it can also become very harmful if done improperly and too often. Sometimes you feel a ‘need’ to stretch, most likely that feeling can be satisfied through SMR. We sometimes experience this when and overstretched muscle is trying to contract, thus SMR will activate the muscle and that need to stretch will subside. Next time you are in the gym, try SMR for 2-5 minutes before and/or after your workout as part of your routine and notice the difference it makes in your everyday life as well as your performance in the gym. Posted on May 4, 2015 at 7:11 am. We’ve talked about focus, about setting goals and about control. These are all essential for progress and reaching your main goal. Now that you have put all that hard work into a regular routine, enjoy the fruits of your labor. Something many people forget is that all of the hard work you invest will take time to pay off. The results will come, in time. Yes, there are some who see their goals being achieved sooner than others. This does not mean that you should compare yourself and try to rush your progress by attempting short-cuts, that never yield permanent results. Whether your goals are weight loss, aesthetic, strength or health, there are products and companies promising results “quicker” “faster” or “easier”. Think about these products, did a doctor recommend them? If they did, are they being paid to endorse it? If any of these companies had found ‘the secret’ everyone would be lined up and the results would be irrefutable. However, that has not happened. Why? Because it does not exist. Permanent results are achieved by hard work, fortitude, and discipline. Compare your progress with where you came from, not where others are in their journey. Don’t put faith in shortcuts that will only slow you down and knock you off track. Have faith in yourself and that you possess the ability to achieve what you have set out to do!